With Andrade Almas and Austin Aries colliding inside the ring, would this week's episode of NXT manage to turn around the brand's recent poor form? 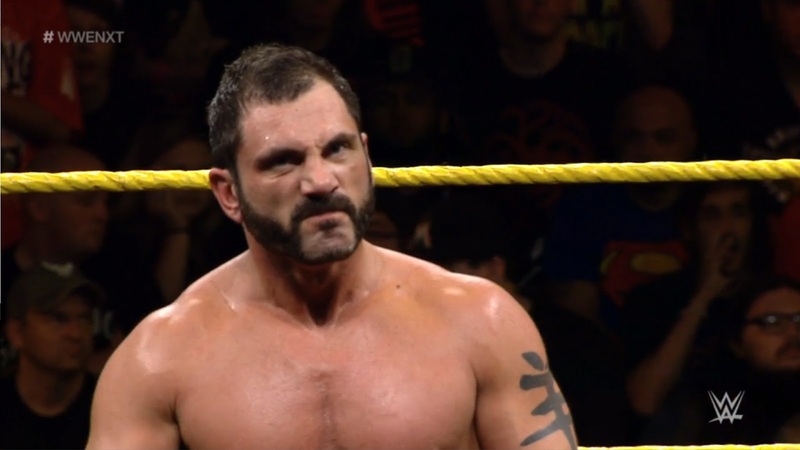 Austin Aries continued to gain momentum, as he went over Andrade "Cien" Almas in a good match. The contest was a strong showcase for both men, who seemed to have some deal of early chemistry with each, as they went through a series of slick action. The action before the ad break was nicely balanced, with Almas managing to stay one step ahead of Aries' tricks of the trade, whilst also showing a degree of showmanship himself as he out-whited Aries run around the ring by pulling out the old spider between the top and middle rope situation. There was some nice little touches, like Aries pulling on Almas' tights as Cien attempted to escape a headlock, which managed to add a little extra spice to what could have ended up a fairly straightforward bout, at least structure wise. The finish was well performed with The Greatest Man That Ever Lived turning Almas' springboard rana attempt into a snap powerbomb, before transitioning seamlessly into the Last Chancery for the victory. Almas' double knee smash in the corner was protected throughout, with Aries managing to dodge the move twice, which would set-up a potential rematch between the two nicely. It would perhaps be worrying for NXT that whilst the crowd were split on Aries, they seemed pretty indifferent about Almas. Cruiserweight Classic contestants Ariya Daivari and Tony Nese made their NXT debuts in a losing effort to the hot and cold tandem TM61 [Nick Miller and Shane Thorne] in a cracking tag bout to kick off the show. To my knowledge, this was the first time that Nese and Daivari had ever been in the same match, let alone tagged together, so I was surprised to see how fluid they were as a unit, putting on some cool double team sequences and working over Thorne well. There was some nice little touches to their work as they controlled the match and found different ways to prevent the hot tag to Miller that I got a real kick out of. The mid-match dive sequence that saw Thorne almost end up in orbit was also damn impressive stuff. The conclusion felt like a slight deflation, however, as Thorne was back inside the ring almost immediately, and whilst his selling was strong, I'd have preferred to have seen him do it on the outside of the ring as he attempted to recover from his prolonged beatdown. TM61 went on to win with Thunder Valley on Daivari as they continue to show promise, but not completely deliver it. NXT Champion Shinsuke Nakamura had his first outing since winning the belt, in a simple squash bout with Steve Cutler. Nakamura is always an entertaining performer to watch and this match resembled a cat playing with a ball of string as he batted Cutler about the ring, appeared to let him take control for a moment just for a change and then rocked him with an inverted exploder suplex and a Kinshasa to get the win. Even with Nakamura being the Champion, this match didn't deserve to go on last, because Cutler is still pretty much enhancement talent for the brand and the one win that he was given last week wasn't going to convince anyone that he was either a viable opponent for Nakamura or that he was capable of having a good match (even with some of the calibre of The King of Strong Style). Samoa Joe's appearance on commentary gave the most interesting developments, as he appeared much more subdued following losing the NXT Championship and walked out following a brief stare down with Nakamura. Ember Moon made her NXT TV debut, picking up a swift victory over Leah Von [Leah Von Dutch] in another good showcase for the former Anarchy Championship Wrestling performer. This felt like an abridged version of Moon's Takeover: Brooklyn II bout with Billie Kay and I enjoyed it much more because of that. All the focus was on Moon and Von did a good job of allowing her opponent to shine, by extenuating certain elements of her character, managing to get a strong reaction out of the Winter Park crowd in the process. That diving corkscrew stunner finish Moon has is a thing of beauty and now perfectly called The Total Eclipse. Asuka claimed she'd driven the competition out of NXT, and at this moment with only two broadcast contests to her name, it feels like Moon could be #1 Contender, already. A much better show from NXT this week, than what they've put out over the previous two episodes, as the show contained two quality contests. Austin Aries and Andrade Almas had a cracking outing that complemented both of their styles well and probably deserved to end the show, whilst TM61 continued to develop in a stellar tag team collision against the debuting Ariya Daivari and Tony Nese. The other two matches were quick squash matches for Shinsuke Nakamura and Ember Moon, both of which showcased the talents well, but it's hard to rate that kind of match particularly highly, especially when one of them includes the NXT Champion. Whilst this show was an improvement, as a whole it still was a below average hour of wrestling.